How is it possible to recover money from insurance policies for environmental remediation costs? How can I determine whether I have a worthwhile opportunity? Sounds interesting, but we can’t find our coverage. Now what? Exactly what type of costs can be recovered? What am I giving up in this process? If I recover a large sum of money, how would I handle the proceeds? What if I am currently thinking of buying an environmental insurance policy? 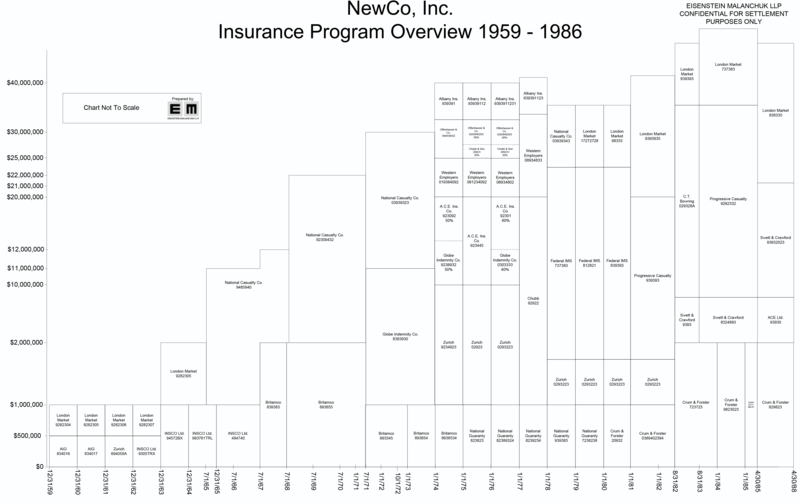 Over the years I purchased $100 million worth of insurance. Can I recover $100 million? How much is my insurance asset really worth? How does insurance recovery affect my relationships with my current insurance carriers? What impact does insurance recovery have on my negotiations with environmental regulators? I don’t want to create new headaches just in order to recover some money. Don’t I trigger additional reporting requirements to financial or environmental regulators by conducting insurance recovery? Aren’t there contradictions between what I say to insurance carriers versus what I say to the regulators? How do acquisitions and divestitures affect my ability to recover on historical policies? Policies written 25 years ago were quite different than the policies written today. Under today’s policies, it generally is not possible to make a claim for this type of damage, unless you specifically have some type of environmental insurance product – otherwise the coverage will have absolute “pollution exclusions,” and often provide only “claims made” coverage, i.e., you must file your claim during the policy period. In contrast, for general liability coverage purchased prior to 1986, you are unlikely to have absolute “pollution exclusions,” and the door is open for you to make a claim. In addition, these older policies were “accident-based” or “occurrence-based.” This means that if contamination resulted from operations during the policy period then you can still make a claim under that policy, even if the policy is 25 years old, or 75 years old. It is these older policies that have been proven to be a significant source of funding for many companies. Although an insurance company is not likely to volunteer this information to you, they are routinely paying claims on policies issued before 1986. Furthermore, they are doing so without litigation, provided they are given a sophisticated claims analysis. If you have (past and future) environmental costs resulting from operations that began before 1986, you may have an opportunity. We’ll find it for you. We have been through this process many times and we have rarely failed to locate sufficient coverage to make the project interesting from a financial point of view. There are many inside and outside sources of information that can be tapped. Of course, the best sources are inside the company. Frequently we see companies that have changed hands, and documents have been lost in the shuffle or discarded because the value of these old policies was not realized. You may have old accounting files that provide clues, or old Board of Directors meeting minutes. Perhaps your lenders or brokers have information. Often we can locate records because you may have had contracts with government entities or others who required you to provide a certificate of insurance. We may not be able to locate your actual policies, but in a non-litigation setting secondary evidence may be sufficient for us to proceed with a claim. Typically, costs you have already incurred cleaning up a site are covered. In addition, your claim will include a consideration of future cleanup costs. You may also anticipate future third-party claims for property value diminution or natural resource damages. If so, these costs are included as well. It may seem odd that an insurance company will pay you money for costs that you will incur in the future, but the process works because the carrier lowers its exposure to future liability while you collect a sum of money to help you manage your own exposure in the future. Insurance companies vary in their individual settlement requirements. Obviously you must give up something or the process would not work. Generally an insurer will require at least a “pollution buyback” for your old policies. This means that you will no longer be able to make claims for environmental damage against these policies in the future. In some cases we can limit this release to just a listed group of sites. However some companies, especially those in “runoff” or liquidation proceedings, may require a full policy buyback where you no longer have any coverage under specified historical policies. You are in control of this settlement process throughout the project, so that you are never forced to do something that you feel is not in your best interest. Your historical insurance asset is depreciating in value over time. The main reason for this is increasing carrier insolvency. 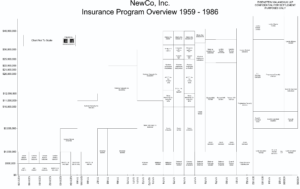 Many former carriers no longer exist or are in “runoff.” This means that a company may still exist, but it is no longer writing new insurance. It will continue to pay claims until all its funds are depleted, but after that point there is no longer any opportunity to make a claim. We have seen corporations where more than 30% of the value of their historical insurance asset has been lost due to runoffs and insolvencies in the insurance market. The other possibility is that the laws governing how insurance cases are decided in a given jurisdiction can and do change. If you have favorable law now then any change might be in a less favorable direction. Although it may be possible for the laws to improve, it has been our experience that in jurisdictions where laws currently favor some insurance recovery, that recovery is maximized by pursuing the opportunity sooner than later. We usually can determine whether you have a worthwhile claim which can be negotiated with the insurers during a day long visit to your company. If a recovery is worth pursuing, then the process can take as little as a few months but generally no more than two years, depending on the complexity of the case. A successful recovery project results in funds to the insured that might be used in several ways. Tax planning is important, and how the funds are handled should be discussed in advance of funds being received. Sometimes a remediation fund is established and used to pay for ongoing and future remediation projects. Some of our clients have used the proceeds to purchase finite risk policies or other insurance products. In other cases the funds have simply been absorbed into the company treasury. You may be considering the purchase of an environmental insurance product such as a cost cap or a finite risk policy to manage remediation risk stemming from a historical environmental situation. In one instance, a company purchased a new product without considering the existence and value of any old policies. It may have been possible to employ the historical policies in a pollution buyback either to fund the premiums for this new coverage or even to recover enough money to minimize the need for more insurance. In each case we need to analyze your potential exposures, and your coverage, to assess the likely recovery. Generally your primary and lower layer insurers will have a substantial exposure, but other insurers, who provided coverage only for losses in excess of millions of dollars, will not be interested in negotiating a settlement. We can provide you with a realistic assessment, anchored by years of experience, as to the likely value of your claim, and you also will generally need to take some sort of “legal discount” off of the allocated amount of the claim. We then need to account for self-insured retentions, deductibles, and carrier insolvencies. In our experience, these claims against old policies do not impact any current insurance discussions. While this is a commonly expressed concern at the outset of a project, there are a number of reasons why these historic claims are not of concern. First, in most cases the carrier that you purchase insurance from today bears no relationship to your carriers of thirty years ago. Second, our process ultimately creates a win-win situation for both the insured and the insurer – the insured obtains a monetary payment while the insurer obtains a release from future exposures. We do this without the need to resort to any time consuming, and perhaps hostile, litigation. If the insurers did not see a mutual benefit to this process then no settlement agreement could be achieved. Finally, it sometimes happens that the settlement proceeds are actually used to purchase more modern insurance products, so that some carriers view our process as a chance to generate new business. Insurance recovery should never interfere with your regulatory negotiations and, in our experience, it never has. When the insurance policies in question were purchased they were to cover unforeseen risks. When you sell these policies back to the company that originally issued them, you are simply assuming that risk back in return for a sum of money. In addition to the overarching concept above, the process is strictly confidential, we collect no new data and employ only publicly available information in our negotiations with insurers. Our process is about transferring risks—a “reverse indemnity” process—and so our methodology does not in any way look to, or depend upon, SEC or similar standards for making estimates for remediation. For example, the insurers expect to evaluate sites where no characterization of contamination exists, or to evaluate natural resource damages even if no complaints have been received. We cannot act as your securities counsel, but in our experience our methodology has been comfortable for scores of companies, who have concluded that no problems arise. Because no new data are collected in our process of settling claims, no new environmental regulatory reporting requirements are triggered. Understanding how your company grew to its present size is important in conducting any insurance recovery project. Your corporate history must be fully known, and the nature of acquisitions and divestitures is important in this regard. For example, if you purchased a property from another company, without acquiring all of the operations of that company, then you may not have rights to the historical insurance policies issued to the prior owner. However, if you made a stock purchase of a company, and thus inherited all of its assets and liabilities, then you likely have rights to any historical insurance policies as well. The transaction documents often do not mention insurance or, if they do, only mention policies in effect at the time of the transaction. In a stock purchase, if the documents are silent about the rights to historical policies, you likely have the policy rights. Part of our process is to review corporate documentation to determine your rights under these old policies.